Description: BNSF 4883 marks my thousandth locomotive on RRPA! Thanks once again Tim. 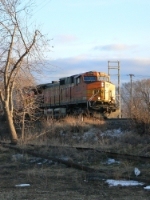 Description: A BNSF freight flys by one of my favorite locations in recent months, Union Jct. Trailing is BNSF 759. Description: Passing some old jointed rail, BNSF 5284 isnt the new guy in town any longer, and one day they will be cast aside like the worn out rail here. Description: BNSF 5284 waits for the signal on CSX (Ex-P&LE) ,Pittsburgh Skyline ahead. Description: NS 7637 leads a nice trio on 64D loaded crude oil train through Swedesburg. Description: Missed the train going south, But BNSF 5284 came through with some autoracks.